The monsoonal rains that swept over Arnhem Land in the wet meant a change of travel plans for literacy teacher Donna Iddon. After more than 800mm of rain was dumped in the region of the East Alligator River in Kakadu National Park Ms Iddon found the roads to her classroom flooded – with her ranger students stranded on the other side of Magela Creek. Undeterred, she arranged an alternative mode of transport – a detour by boat down the billabongs and floodplains to the East Alligator River ranger station where her students were waiting. 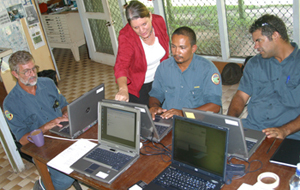 Ms Iddon usually drives out from the Jabiru Training Centre of Charles Darwin University each Monday to teach literacy and computing skills to the rangers whose live-in station is a few kilometres from the East Alligator River. But for several weeks the swollen waters of the Magela Creek have blocked her path. It has meant arranging for a boat from the ranger’s station to ferry her and the teaching equipment on a winding journey across the floodplain to where the water levels have fallen, where a vehicle has been waiting to take her the final stage of her journey. ‘What better way to go to work on a Monday morning than travelling down the floodplain,’ says Ms Iddon, who brushes aside the fear that crocodiles or snakes might be lurking in the floodwaters. 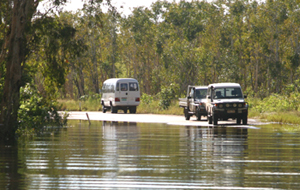 As she hitches up her trousers to wade from the boat to the four-wheel drive Ms Iddon barely stops to glance down into the waters, concentrating on the task of transferring the equipment to the vehicle with the help of ranger Fred Baird, who skippered the boat from the point where the Magela Creek flooded the road. The creek, swollen into a broad swathe of billabongs and winding waterways, actually cut off the road in two places. So the boat takes her past dense stands of paperbark trees and through lush wetland greenery for about 2km to where the water levels have fallen. She knows she’s reached the end of her journey when the boat bumps up against the road, the white line in the centre visible over the edge. Her only problem is that in getting out of the boat the water is up around her knees, and her rolled-up trousers are getting wet. ‘I wish my legs were just a bit longer,’ she laughs. Safely arrived at the East Alligator River ranger station she rounds up the rangers, plugs in the computers and is soon delivering the computing lesson. A couple of hours later she retraces her step the same way by four-wheel drive and boat. 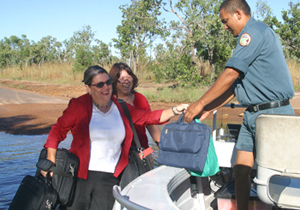 It’s all in a day’s work for the resourceful teachers in Jabiru who find ways around the problems of climate extremes.